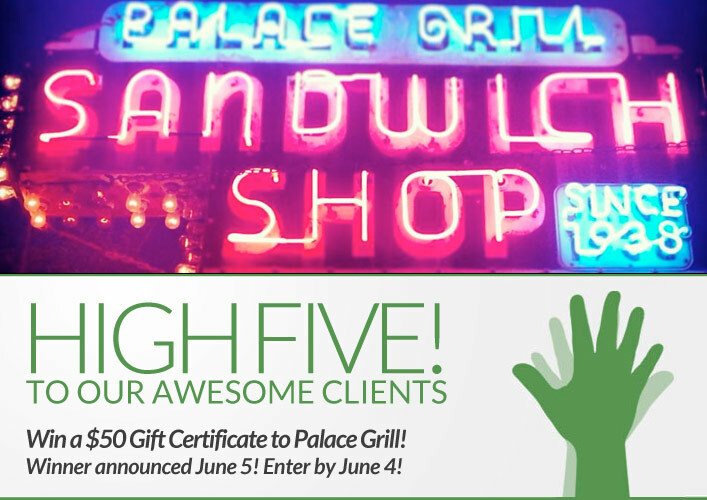 Win a $50 Gift Certificate to Palace Grill! Congratulations to Maggie Maddox on winning our thirty fifth High Five Giveaway and thank you to all who entered! Our next giveaway is for a $50 gift certificate to Palace Grill. The Palace Grill is a classic diner with stainless steel counters and tables, welcoming customers from all walks of life, and you just never know who is going to stop in. The restaurant has famously been visited by Oprah Winfrey, Mayor Daley, Al and Tipper Gore, the Russian Prime Minister Viktor Chernomyrdin, countless TV/radio personalities and of course everyone’s favorite- the Chicago Blackhawks. The Blackhawks regularly pick up egg sandwiches aka “heart stoppers” before practice, and they even brought the Stanley Cup to the restaurant three times in 2010. The Palace Grill restaurant is located at 1408 W. Madison St. Chicago, and has been serving good food at affordable prices for 75 years. Visit their website at palacegrillonmadison.com or call them at (312) 226-9529. What is the name of the organization that XEX will begin a new program with in June 2013? (Hint: Check out our community page for the answer! Now, just add a comment to this post with the right answer to be eligible to win! The winner will be announced on Wednesday, June 5. Entries must be received by midnight on Tuesday, June 4. Imerman Angels. I think this is a really great initiative, great community support, and a smart way to get the word out. I’ll be getting my hair cut for the first time here on Wednesday! What a wonderful program this is! Imerman Angels is the organization you’ll be partnering with beginning in June & even if I don’t win, how can I find out more about the Mentor Angels? My mother-in-law was just diagnosed with breast cancer and having a very difficult time with it. I know she would love an angel by her side.